Should U.S. Senator John McCain run for re-election, he knows he will likely face a primary challenger. So McCain advocates are already projecting the idea that the incumbent is “too big to fail” in 2016 as rising potential contenders like Arizona State Senator Kelli Ward consider taking on the challenge. Lake Havasu City Republican Senator Ward describes herself on Twitter as a “mom, military wife, family doctor” with a focus on “liberty, freedom, personal responsibility” and small government. She wants to, “lead by following US Constitution.” Ward projected a similar description when speaking with The Arizona Republic on a potential McCain challenge while responding to potential critics and naysayers. 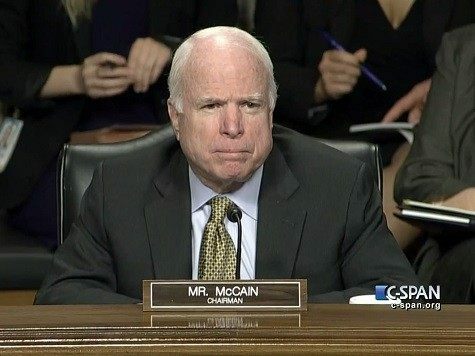 Last year the Arizona Republican Party formally censured McCain for stances determined too liberal, the Republic explains. McCain backer and longtime political consultant Sean Noble was referenced in the Republic, not surprisingly saying he has doubts that influential heavy-funding political groups such as the Club for Growth, FreedomWorks and the Senate Conservatives Fund would support Ward. He made the claim to the Republic that those heavy-hitter political funders wouldn’t “waste their money” on Ward. Noble disparaged the potential for the Arizona State Senator to overcome the McCain machine citing the 2010 Tea Party revolution during which the then fledgling grassroots group did not manage to unseat the U.S. Senator. Representative Paul Gosar, once considered a possible McCain challenger, says instead that he will pursue re-election to his own seat in the U.S. House of Representatives. Representative Matt Salmon’s name is also being floated as a potential contender for a McCain primary challenge, but has not made any official declaration at this point.